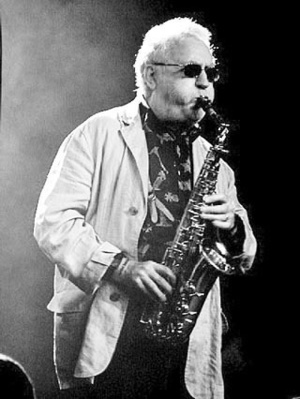 The Lee Konitz Quartet will be performing on Friday, December 5th at 8pm at the Wexner Center for the Arts. Noted alto saxophonist Konitz will be joined by Jeremy Stratton playing bass, Dan Tepfer on the piano, and George Schuller on drums. Though his first instrument was the clarinet at age 8, Konitz later changed to the saxophone before beginning his jazz career at 16. Many credit Konitz as being one of the first and only at the time to shy away from the stylings of Charlie Parker and improvise a sound of his own. After moving to New York in ’49, he played with Miles Davis in his nine piece band at age 22, then with various duos, trios, and quintets, and even with an orchestra; but he never stayed on steadily with any band for more than two years and rarely took on the role of band leader. He also worked sporadically over a period of time with pianist Lennie Tristano, after they met when Konitz was just 19; one product of their time together was the groundbreaking recording of “Intuition,” one of the first freely improvised jazz recordings. Konitz spent the early ’60s teaching and playing in California, then many years doing the same throughout Europe, after which he resided in Cologne, Germany until recently returning to New York. Now at the age of 87, his years of jazz experience can be observed in an evening at the Wexner, right here in Columbus. More information and tickets are available here.